Is there a more romantic sight than a couple strolling hand in hand along the beach? Gliding across fine sand, as the sun beams down from above. If this sounds like heaven, every day will feel like 'la dolce vita' on these shores. The waves here seem to take on their own mesmerising shade of Blue, the finest Sardinian Sapphire. And the beaches are the most brilliant strips of white and gold. With over 1000km of coastline, you're simply spoilt for choice! Whether you're seeking out a quiet spot or a beach that's a little more vibrant. Spiaggia Su Portu is practically perfect when it comes to beaches. Its semi-circle of white sand is caressed by those beautiful blues, with surrounding cliffs adding a rugged charm. The stunning lake is the cherry on the cake. Flamingos can be spotted here, with those vibrant pinks popping against those beach colours. And these intriguing birds mate for life! If that's not a sign of romance, we don't know what is. 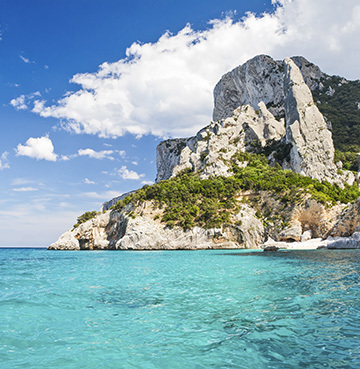 Cala Goloritze can only be reached by foot, so if you're craving seclusion this is the place to be. It's quite a hike but it will feel like love at first sight as you lock eyes on this beautiful cove. Towering limestone seems to shelter Goloritze, with these formations adding seclusion and stunning scenery. If this intimacy and natural beauty has your heart pounding with excitement, be sure to take in Sardinia's sea caves. The Grotto del Bue Marino is a coastal masterpiece in the east! As you arrive by boat, you're greeted by two curving arches in the cliff face. Entering is just as impressive, with rock formations lining the kilometre of tunnels open to the public. And as you reach the mesmerising lake, you'll really feel like love is in the air. On the other side of the island, Neptune's Grotto welcomes you with open arms. 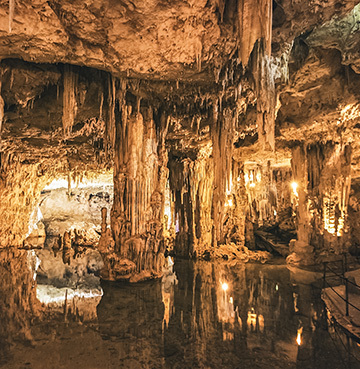 There's plenty of stalagmites, stalactites and rock formations for you enjoy here. Romance awaits beneath the rocks. It's hard to talk about Sardinia without adding a pinch of culture. Especially with cities as animated and interesting as Alghero! A fascinating blend of traditional Italy and Catalan influences, with true delights encased in the Old Town walls. The maze of cobbled streets leads you to bustling piazzas and architecture of Sardinian past. From Spanish influence to Roman architecture, Cagliari's another treasure trove of historic wonders. A stunning amphitheatre was carved directly into the rock face here and the impressive ruins still stand strong today. With a glitzy harbour, vibrant cafés and plenty of piazzas, Cagliari is modern life effortlessly mingling with times gone by. If you ever needed a sign of Sicilian romance, just look at the number of newlyweds saying 'I do' to a honeymoon on these shores. Although if red truly is the colour of love and passion, it's easy to see why! Bubbling lava, delightful wines and beautiful buildings all come in their own unique Sicilian shade. It's no surprise that Mount Etna dominates the eyeline – this is Europe's tallest active volcano! Its dark rocks and billowing puffs of white smoke create a wonderful spectacle. A Sicilian Ebony and Ivory in perfect harmony. The hilltop village of Taormina is arguably one of the finest places to enjoy Etna, sitting at the foot of the mountain. Head to its Greek theatre and you'll be treated to a splash of culture alongside the panoramas. A wonderfully preserved monument, taking a seat here places the Ionian Sea and Mount Etna all within your gaze. There's not many better spots to share with your special someone. Sicily has been working its charm for centuries. If you look into its past you'll find that Greeks, Romans, Arabs, Normans, French and British all fell under its spell at one point or another. And this all makes for a fascinating collection of ruins and monuments. None more so than the Valley of the Temples, which could easily be ancient Greece. The Temple of Concordia has been impeccably preserved, giving you a true flavour for the empire and Sicilian life under Greek rule. 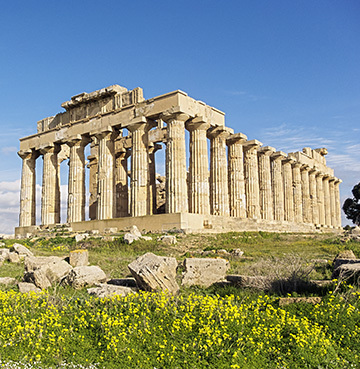 A trip to Selinunte transports you even further into Greek past, with its acropolis a brilliant beacon among the ruins. A romantic stroll takes you through the greenery and past the temples, with a backdrop of golden sand and shimmering sea. Palermo is an eye-opening city, where the fascinating past blends seamlessly with modern life. 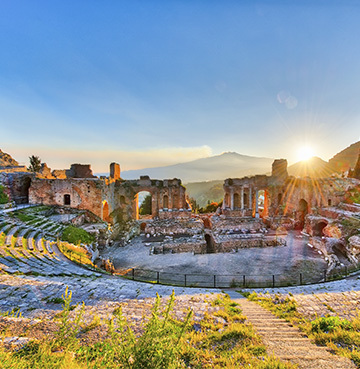 Exploring the Sicilian Capital with your loved one feels like your own little adventure! You're never too sure what's waiting around the next turn. You might stumble upon a market oozing Arabic sounds and scents, or a restaurant serving up some Spanish delights. Norman palaces sit a stone's throw from Baroque buildings, with the streets still holding an Italian feel. Palermo's piazzas reinforce Italian tones, so why not grab a seat and watch the locals going about their business. From beautiful squares lined with trees, to those with intricate fountains at their heart – a piazza is a must on your visit to Palermo. 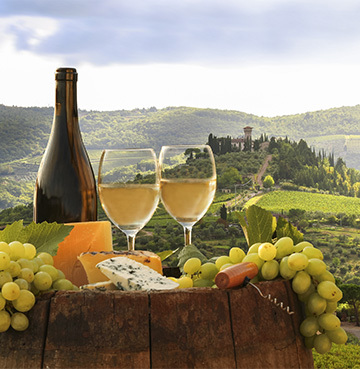 Where better to raise a toast to the two of you than Tuscany? The land where whites and reds flow freely into bottles enjoyed all around the world. You're never too far from an aromatic tipple, with vineyards and wineries dotted throughout. So why not pop the cork on your romantic getaway and enjoy a tasting tour together? Crisp whites, fruity reds – find the wine that captures you as couple! Bottle love and take it home with you, whenever your pour a glass you'll be reminded of your time in Tuscany. These flavoursome grapes take pride of place in a gorgeous landscape that's inspired artists for centuries. Michelangelo, Leonardo da Vinci and Galileo Galilei all cut their creative teeth in the Tuscan region. Head for Florence and this wave of artistic flair washes over you. And there's nothing more romantic than a stroll among the masterpieces, so get ready to really stretch your legs. Michelangelo's David, Neptune's fountain and so much more are a treat for culture-loving couples. Wind your way through the streets and take in palazzos, piazzas and the intricate Cathedral, with its dome dominating the skyline. Climbing this crowning glory, Florence feels like it's all yours. These extra steps are well worth it when you reach the panoramas of the city below – the perfect view for two. 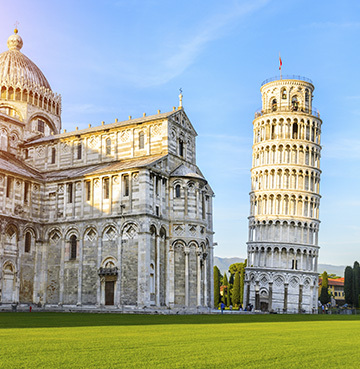 With Pisa in touching distance of our Tuscan villas, you could soon be stopping for pictures at the Leaning Tower. Ticking one of the world's most unique monuments off your list. Pick the perfect pose and capture an amazing memory. Perhaps you'll pretend to hold it up, showing just how your strong your love is! There's more stunning views atop the tower, if you're prepared to climb once more. Tackle the steps together and pick out all the wonderful sights below, from the Arno River to the medieval cathedral. However you spend your day here, this wonderful city will always hold a Pisa your heart. The beauty of Tuscany is that it's packed full of surprises. And if you've been busy pounding pavements and climbing steps, Saturnia Thermal Baths are a sight for sore feet. Unwind together and soothe those aches in these natural hot tubs. Warm cascading water fills these pools to what feels like the perfect temperature – Tuscan bliss! You'll find more brilliant blue waters along the coast, complemented by glorious golden sand. The countryside may take most of the plaudits but the coast quietly goes about its business. With lush greenery acting as a beautiful backdrop, beaches here are perfect for couples. There's just something about Amalfi! The charming towns, the coves and bays, the craggy coastline – every little piece feels picture perfect. Even a quick glance at a photo seems to tug at your heart strings. Especially if it's a snapshot of the seaside towns, where colourful houses each carve their own little spot into the cliff face. Like tiers in a wedding cake, you and your loved one are the perfect toppers for this sweet coastal beauty. 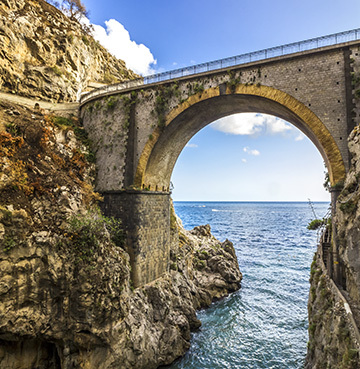 Romance seems to be waiting around every twist and turn of Amalfi's winding coastal roads. So you're never too far from a charming spot! With each offering their own unique twist on Italian romance. 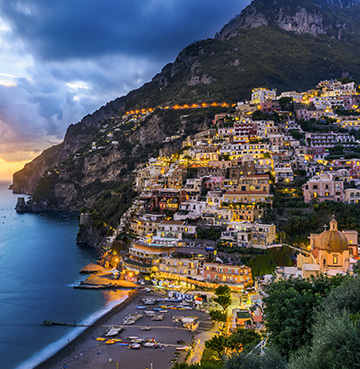 If your perfect evening consists of you, your loved one and the setting sun, look no further than Positano. This picturesque village somehow seems even more beautiful in the golden glow, lighting up the vibrant houses. Days in Positano are perfect for people watching and admiring the natural beauty, so pull up a stool at a waterside bar and drink it all in. There's less bustle and more beach charm about Praiano, home to quirky coves and inviting bays. Away from the crowds, that fishing village feel still floats along the sea breeze. You'll even find small boats lining the pebbly shores of Marina di Praia! Tucked between two cliffs, there's an intimate feel here that's perfect for pairs. Being stuck between these two towering rocks certainly isn't a hard place! Praiano's also home to another beach with stunning scenery. Gavitella gazes longingly at Capri, the Li Galli islands and beautiful Positano in the distance. So when you need a break from looking into each other's eyes, find a spot on the shore and let the coast captivate you instead. Conca dei Marini is another Amalfi gem offering fewer tourists and more character. Love is certainly in the air here, but there's one sight that will have you falling head over heels. The Grotta dello Smeralda is an enchanting cave, where the water holds a green glow. As you're rowed around the 'Emerald Grotto' you'll be falling for each other and Amalfi all at once. If you're craving more quality time together, a secluded beach awaits just along the coast. In fact, this is one of the finest spots on Amalfi! The 'Furore Fjord' nestles a quiet cove between two cliff faces, connected by a magnificent arching bridge. As the midday sun lights up the beach, that brilliant blue sea will start working its charm. Discover even more wonderful things to do in Italy and add your own romantic spin on these with the one you love.